Hey Mom, got any leftovers? 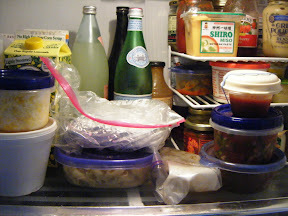 Thanks to all you well fed leftovers-Eaters who shared the contents of your fridge with me after yesterday’s post. And a special thanks to Laurie Amster-Burton (mother of that famously Hungry Monkey and star of kitchen and small-screen, Iris Amster-Burton) for directing me to Lesley Porcelli’s gourmet.com blog “The Kid’s Menu” — for a mom-centric look on what to do with leftovers. At left: gourmet.com fridge (photo: Stephanie Foley). Right: a “real” mom’s fridge (mine). 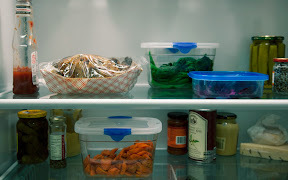 Appropriately enough, Porcelli offers some “gourmet” tips on how to fix something worth eating while dealing with the utter exhaustion that come from having a screaming baby on one hip and a laundry basket on the other. New parents (and old) should glean some insight. Parents? Any tips of your own to add — in your copious amount of spare time, of course.